I’ve never made a big hub bub about Valentine’s Day, but I don’t see a reason to hate on it. I’d rather just embrace another day to show the people I love that I love them. That being said, I don’t like to go out on Valentine’s Day, it’s just terrible. I don’t want the overpriced meals, the crowded restaurants, and just the overreaction to the day to have to rush out and do something with your significant other. I’m a homebody and have always preferred to celebrate Valentine’s Day at home or on a different day. If you’re like me, here are 14 ways to celebrate instead. Do the thing you always say you’re going to do together whether it’s just going to a yoga class, booking a trip, or taking a nap. Host a game-night for couples, you get to stay in your house and have fun! Do Valentine’s Day on a different, less busy day. Better yet, do Valentine’s Day on a weekend and make a trip of it where you can be a homebody in a hotel room! Create a self-care day. You would be surprised how much guys who don’t often soak in a tub or take care of their nails actually enjoy when you take time to do these things with them. Do you have any Valentine’s Day tips for broke, introverts like me? Leave em below! I’ve basically never minded Valentine’s Day. I think the only year it really bothered me was a couple months after me and my long term ex broke up and I went to a party, cried, ordered a ton of pizza and cried some more. IT HAPPENS. I’ve also never been super excited about the day. I like taking the chance to show a lil love to the people in my life, but I think that should be done regardless of a holiday. ANYWAY! Here’s some posts I’ve written in the past about Valentine’s Day to get you in the mood. 😉 Enjoy! I get bored so easily, therefore I travel often. Changing scenery often helps my restlessness. Valentine’s Day weekend was the perfect time to get away. We initially planned a trip to visit multiple abandoned places like Centralia and the abandoned Pennsylvania turnpike. When we reached our first destination, we quickly realized the snow from a few days earlier had ruined all our plans. It would be impossible to get to/see these places in the snow. I was more than bummed. But the quick thinking of my boyfriend turned the whole day around. We went to Hershey and did the free tour and a chocolate tasting which was so fun. We already had an AirBnB booked in Harrisburg so we headed there next. I will always recommend AirBnB’s, I’ve never had a bad experience and they are so inexpensive. We got lunch in Harrisburg at an awesome gallery and brewery called The Millworks (https://millworksharrisburg.com/), would definitely recommend. Then we walked along the waterfront before heading back to our AirBnB to relax. We got dinner at Rubicon, which was great! The next morning we got breakfast and explored the capitol building a little bit. 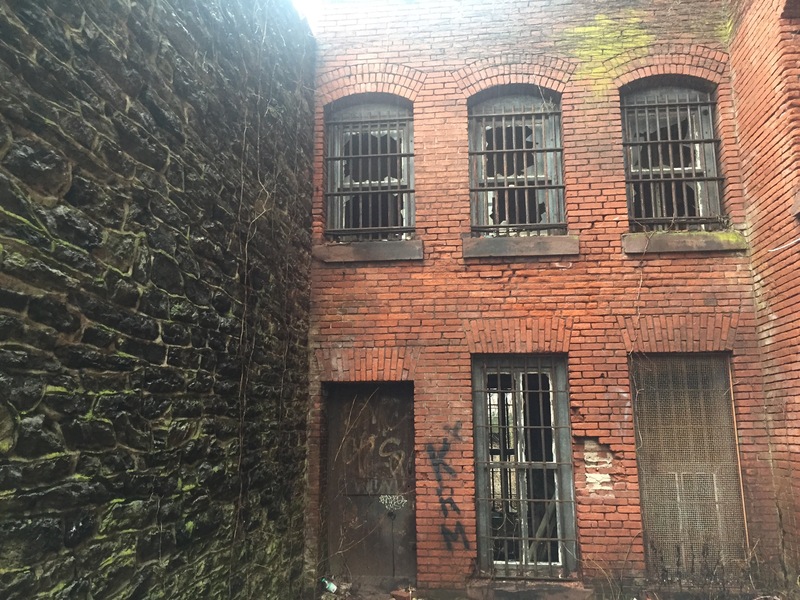 We then decided to take a stab at seeing the last abandoned place on our list, the old York County Prison. This place was awesome and creepy. It is easy to get to and to get inside, but it was muddy and I’m a scaredy cat so we didn’t go in. All in all, weekend trips are so much fun and I will be definitely planning more for the future. It is great to be able to explore the world, but sometimes you just need to explore your neighboring states! A lot of us have bitter feelings towards Valentine’s Day. For most of my life, I didn’t. Even when I didn’t have a boyfriend I still liked the hearts and fluff of the holiday. One year I was bitter and all it did was make me more miserable of a person than I already was. Because in the end, it’s just a day. But if you want to look closely at it, it’s a day to remind ourselves to love. If you don’t have a significant other to express that love to – it’s okay! You can love your friends, you can love your family, and you can love yourself. In my single years I’d buy presents for my also very single friends just to see them cheer up a little. And my mom would send me a little gift card to show her love. But I often neglected to look at the holiday as a time to give a gift to myself to show my love. Self love is so hard. And to think about it all the time is just an exhausting competition with your inevitable self hate. But if you’re going to pick yourself apart all the time, at least use Valentine’s Day as the one day you’re not going to do that. Whether you’re single or in a relationship or in between, love yourself this Valentine’s Day. Put on some lipstick or throw on an extra nice shirt for work. Tell yourself that you look good – because you do! Buy yourself a nice dinner or get yourself a little gift. That one present for yourself that you’ve been putting off for so long. It’s a day of love, there’s no need to resent it. You have love all around you and all up in you – so express it! Thank You And Happy VDay WordPress! When I was young I always loved Valentine’s Day. I would wear shirts with little hearts on them and hand out little cards and candy. When I was in a relationship it was just another day to remind my boyfriend I loved him. When that relationship ended, I couldn’t stand the day. I sobbed and spent $40 on pizza the first Valentine’s Day without him. I honestly can’t thank you all enough for the reblogs and help you have given me along the way. I plan to write a post soon that links back to all of the people who have really supported me. This blog and interacting in the community makes me so genuinely happy. WordPress, Will You Be My Valentine? So, Valentine’s Day is a few days away. It’s pretty apparent that I’m going to be single this Valentine’s Day. I’m not too upset about it, it’s just an opportunity to treat yo self. I’ve been writing down goals for myself recently. By the end of January, I hoped for 400 followers on WordPress. Before January even ended I reached 421 followers 🙂 I couldn’t have done it without the people who have reblogged me. I don’t know why I’m always surprised by the generosity and kindness of the blogging community – probably because it’s so hard to come by in the real world. So from the bottom of my heart, thank you so much to those blogs who have promoted me. As a writer, I hate when words can’t express how I feel lol but just know I can’t put into words how thankful I am. By Valentine’s Day, my goal is for 500 followers. So, if you want to get me a Valentine’s Day present – this is what you can do! If you have ever given a small thought to reblogging me, linking back to Hookup Culture, or promoting my blog – now would be an awesome time 🙂 I am currently at 487 followers – only 13 away from my goal! I’ve been working really hard on building my following and I am soooo thankful for all the new bloggers that have come into my life recently, as well as the ones I have been in contact with from the beginning. I believe that 500 is a pretty big reach for me, but with hard work and your help maybe I can give myself the ultimate Valentine’s Day present. Which is 500 of you beautiful people following my blog! If you have any goals written for your blog – let me know if I can help you as well!